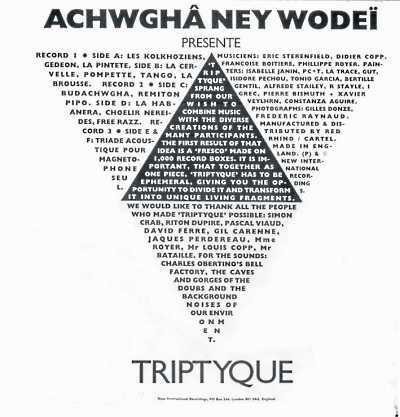 Widely assumed to be an alias side project of bourbonese qualk, Achwghâ ney wodei with an equally ridiculous name were infact a real group; Didier Copp , Eric Sterenfield (‘Riton’) , Françoise Boitiere , Phillippe Royer (‘Woudi’) who were active in the so-called ‘alternative’ Parisian music scene in the late Eighties. With peers such as as Mano Negra, Bérurier Noir’ and Les Negresse Vertes, Achwghâ ney wodei complemented the eclectic style of the times with a cartoon comedic style based on French working class Chanson, music hall and character driven vignettes. Geoff (Leigh) was keen to broadcast the output of our recent audio collaborations – so here we go; an mp3 of rough mixes of electro-acoustic improvisation: Geoff Leigh on Flutes and Myself on ‘other things’. you can hear more of Geoff’s work on: Geoff’s myspace page. The image above was nicked from Ian land’s extensive photographic library of trees and sky around Hastings.